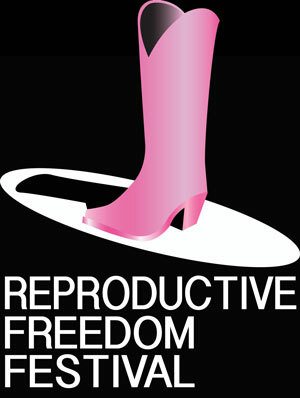 The Reproductive Freedom Festival is a theatrical event. Writings selected from open submissions are being performed by actors in New York. Through the magic of high-quality Live Streaming, the performances will be available for simultaneous viewing and interaction across the country, and the world — anywhere that a computer or mobile device can be accessed. The Reproductive Freedom Festival is a project launched by Words of Choice, dynamic theater in support of reproductive rights and freedom. Originally founded to open up new conversations on reproductive rights, Words of Choice first performed in 2002 in New York. Our signature performances, a mosaic of a dozen writings, are presented by an ensemble and have toured to more than 20 states in conjunction with over 100 organizations, are available by DVD, were Live Streamed to thousands worldwide as part of the Wired Arts Festival by VirtualArts TV. Words of Choice is published in Frontlines: Political Plays by American Women, and has performed on radio, at conferences and events. We also produced the first Reproductive Justice Walking Tour with live performances, a virtual video tour and a toolkit. We conduct Creativity Workshops on reproductive rights, maintain a blog of creative initiatives, and have been honored by several organizations, including NARAL ProChoice America and the Abortion Conversations Project. Rachel Goddard is Production and Marketing Manager for the Reproductive Freedom Festival. Read an article by Rachel about Arts Activism for Bodily Autonomy. Stacey is a NYC-based professional actor, producer and teacher of acting. Executive Producer of Third Wing Media which produces film, online content and theatre in NYC and a Producer and Content Creator with Virtual ArtsTV which streams live Off Broadway theatre. As a founder and Artistic Director of Kids Creative Collective, a non-profit arts organization which makes theatre with children and teens in NYC public schools, Stacey works with kids and teens in schools which historically have no access to arts education. Select Professional Acting Credits – Off Broadway: GOD OF VENGEANCE (The Barrow Group), MODOTTI (The Acorn/Theatre Row), AMENDMENT 13 (Clubbed Thumb), GHOSTING, LOST IN LIGHT (The Public Theatre), HEAVEN CAN WAIT (Actors Studio), DOWN THE ROAD (ATA). Regional: SHIPWRECKED! (Capital Rep), A STREETCAR NAMED DESIRE, UNCLE VANYA (New Harmony), ECLECTIC SOCIETY (Walnut Street), ROMEO AND JULIET, AS YOU LIKE IT (Smoky Mountain Shakespeare). London: OLD TIMES, SIROCCO (Royal Court). Film: THE LAST 48, THE WEEKEND, SWINGING IN BETWEEN, SHALLOW POINT, THE FIRST BORN, GODZILLA. Web: FIRST WORLD problem, 12 MONTHS OF JUNE. Television: GOSSIP GIRL, AS THE WORLD TURNS, ED, RESCUE ME, THIRD WATCH. MFA, NYU Graduate Acting Program. Read a blog by Stacey on What It Means to Her to Do Theater About Reproductive Freedom. VirtualArtsTV is the inventor of the modern, live-streamed performing arts experience. Developers of the first online platform and the first mobile app for the live-streamed performing arts, all VirtualArtsTV projects are shot with multiple cameras, edited in real-time, and streamed live to the internet via state-of-the-art equipment and techniques. VirtualArtsTV projects have been seen by hundreds of thousands of viewers all over the globe and have been covered in The New York Times, The Wall Street Journal, CNN Turkey, Paris Match and ABC.com to name just a few. Creators of the first live-streamed interactive play, the first live-streamed performing arts festival, the first-live streamed webathon, the first live-streamed off-broadway play and many, many more, recent VirtualArtsTV projects include the acclaimed Bedlam’s Hamlet, streamed live to New York City schools and Jay O’Sanders’ concert reading of Unexplored Interiors, streamed live to Rwanda and viewed by audience members in Iceland, Sweden, Uganda, Switzerland, France, South Africa, Belgium, Canada, England and The United States, Smoke by Kim Davies live-streamed from The Flea Theater in NYC, and TRUTH! The Musical, live-streamed from THEARC Theater in Washington DC.